We are travelling with children. What should we consider? 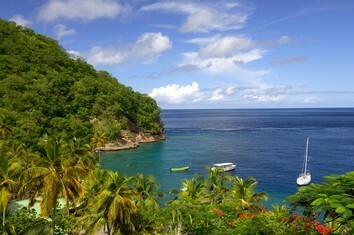 Saint Lucia (Sainte-Lucie) is an island nation in the eastern Caribbean Sea on the boundary with the Atlantic Ocean. Part of the Lesser Antilles, the country is located north / northeast of the islands of Saint Vincent and the Grenadines, northwest of Barbados and south of Martinique. Its size is 620 km² with an estimated population of 160,000. Its capital is Castries. As a Commonwealth realm, Saint Lucia recognizes Queen Elizabeth II as its Head of State, represented on the island by a Governor-General. Executive power, however, is in the hands of the Prime Minister and his or her cabinet. Tourism is vital to St. Lucia's economy and the economic importance of such is expected to continue to increase as the global market for bananas becomes more competitive. Tourism tends to be more substantial during the dry season (January to April). St Lucia tends to be popular due to its tropical weather and scenery, and its large number of beaches and resorts. East Caribbean Dollar - however the US dollar is also widely in use and accepted. Shoppers will be dazzled by the beautiful colors and scents of the handmade clothing, paintings, and carvings as well as spices. St. Lucia boasts the highest ratio in the world for number of Nobel laureates produced with respect to the total population of the nation. The climate in Saint Lucia. Castries is located in a flood gut and is actually built on reclaimed land. It houses the seat of government and the head offices of many of the businesses both foreign and local. The city's design is in a grid pattern similar to New York but on a much smaller scale. It has a sheltered harbour which receives cargo vessels and ferry boats. Rodney Bay is situated in the north west of the small beautiful Caribbean island of St Lucia.It is the area of the tourist activity, althought it is situated the other end of the island to the international airport.It is home to the beautiful Reduit beach, which is lined with some stunning local hotels and bars. Down in the south of the island, Choiseul is a tranquil oasis of a community.Well kept properties and friendly residents make Choisel a very attractive location for setting up a home or for a holiday getaway, surrounded by a lush tropical countryside and easily accessible. The majestic Gros Piton is a perfect backdrop for the afternoon G&T. Soufrière shows signs of Amerindian occupation. Today, the discovery of the terraces and carved rocks at Belfond and the exciting new petroglyph find near Jalousie indicate that Soufrière was perhaps one of the most important sites of all. Vieux Fort is located in the southern part of St. Lucia. It is the second largest town on the island and is the home of St Lucia's international airport, Hewanorra International Airport. (Hewanorra is the island's old Amerindian name). Vieux Fort is also the name of the Quarter that encompasses the city. Fond Doux Holiday Plantation in St Lucia is a colonial plantation hotel set in nature amidst the lush, tropical foliage of St Lucia’s breadbasket historical centre and world heritage site, Soufrière. Fond Doux Plantation estate in St Lucia is ensconced in tropical gardens, and surrounded by one of Soufrière’s most active agricultural plantations. As the largest gardens in St Lucia, this site is one where visitors can find a quiet corner to sit among the flowers, away from any other tourists.The gardens are built around the hilltop ruins of the Baron Micoud Estate House dating from 1766. Baron Micoud was a French army colonel and former Governor of St Lucia. The Fregate Island on the Atlantic coast is the site of a nesting colony of Frigate and other birds. To protect this diminishing species, no visitors are allowed on the mangrove islands. Several years ago the very large Frigate birds were uncountable, but now they number about 35. Fees collected from visitors go toward conservation work. The last major volcanic eruption in St Lucia occurred about 40,000 years ago and the last minor one was in 1780. To this day this volcanic pit continues to vent sulfur into the air and heat pools of water above boiling. The sulfur, which was even mined and exported, is the source of the name of the nearby town of Soufrière.